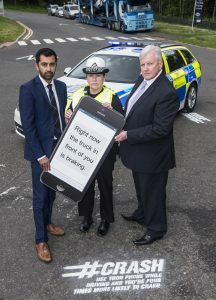 Transport Minister Humza Yousaf, today (26 June) launched the A9 Safety Group’s campaign to raise awareness of the dangers of looking at or using a mobile phone while driving. Using the strapline ‘Looks Can Kill’, the campaign highlights that you are four times more likely to crash if using a mobile phone while driving. The A9 Safety Group, as part of its continuing drive to reduce casualties on the route, knows that a number of collisions over the past two years may have been caused by a high degree of fatigue or distraction. This along with new research1 revealing that social media and ‘in car’ technology are causing a major distraction to Scottish drivers, continues to highlight the significant safety concerns around this issue. The campaign, which will run across radio, online and at public areas along the route, will highlight the clear dangers of both looking at and/ or using a mobile phone while driving. Transport Minister Humza Yousaf said: “The consequences of using mobile phones for either making calls or for social media are all too apparent. The work being carried out by the A9 Safety Group clearly indicates that drivers are putting both themselves and others at significant risk with this activity. “The Scottish Government is committed, through Scotland’s Road Safety Framework, to achieving safer road travel in Scotland. I have said many times before that one death on Scotland’s roads is one too many and we will continue to try to make the roads as safe as they possibly can be for all road users. The campaign research reveals that thirty per cent of people have seen someone using social media while driving and one in five people have witnessed selfies being taken behind the wheel. Sixty eight per cent of Scots have noticed someone texting behind the wheel and a massive 89 per cent have seen drivers talking on a hand-held mobile phone. Further research shows that younger2, tech savvy drivers use their mobile phones more frequently, with over a third admitting to occasionally sending texts while driving and one in ten using social media behind the wheel. One in five Scots would expect someone who is driving to reply to their text and 39 per cent of drivers admit to adjusting their sat nav while driving. Chief Inspector Louise Blakelock from Police Scotland said: “Mobile phone use continues to be a concern for Police Scotland and the wider use of phones for social media use is now being identified as a contributory factor in a number of collisions. In the last two years a high proportion of fatal and serious accidents on the A9 Trunk Road are likely to have been caused by driver fatigue or distraction. For more information about the campaign visit a9road.info or check out the Transport Scotland Facebook and Twitter (@transcotland) pages. A path between Muthill and Auchterarder – Good idea? Bad idea?